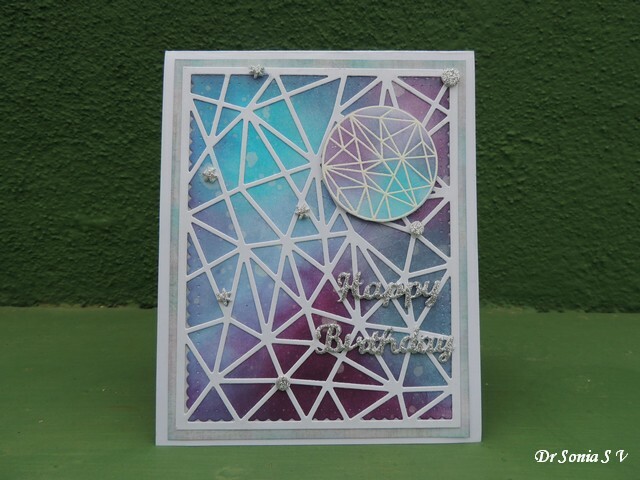 Hi friends the "galaxy" theme is very much in vogue in crafting circles and I was pleasantly surprised how easy it was to make using Distress Inks ! 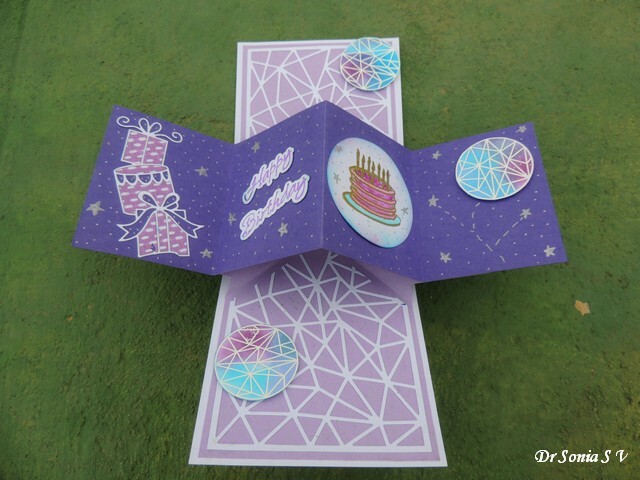 I layered a Winnie and Walter die cut over my galaxy background and added a "planet" [from Winnie and Walter True stamp set]too! 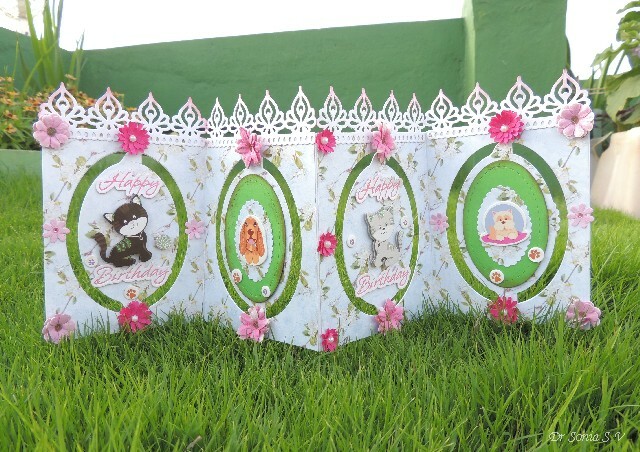 On opening, this is a super fun Pop Up Card and a folded 4 panel accordion strip swings up and opens out horizontally! 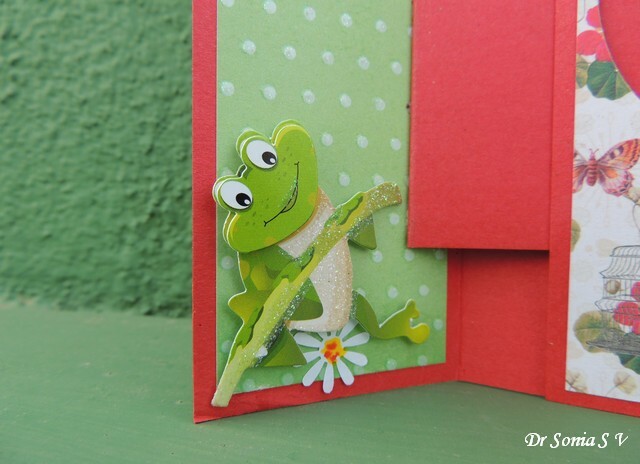 It is a super fun mechanism to play with and I tweaked a tutorial by Kevin to make this card mechanism! 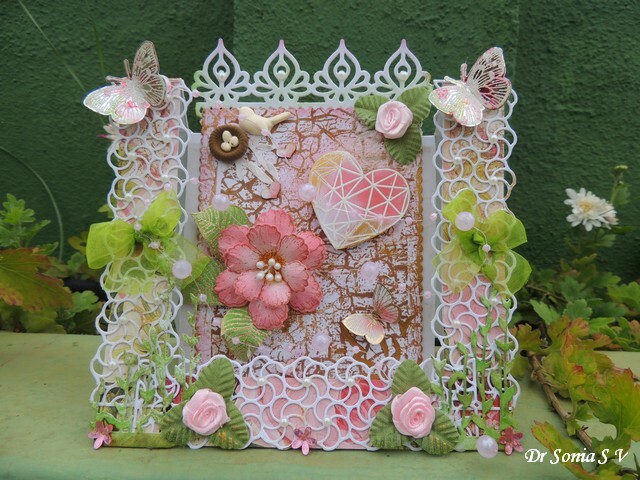 Kevin's tutorial may scare most of you away but I promise I"ll soon share my modified version which is easier and totally doable ! I doodled on some stars and dots on my pop up strip for the galaxy theme. 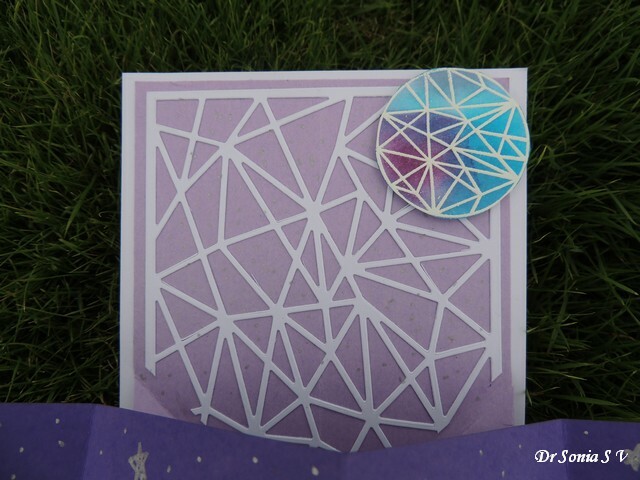 The stacked presents was made using a die from Poppy Stamps using the inlaid die cutting technique. 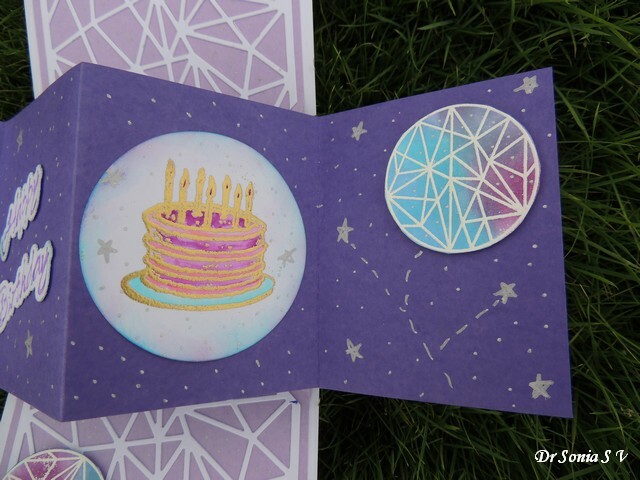 Gold and purple look so good together and so my birthday cake was heat embossed golden and water-colored purple .Also added a few more planets! 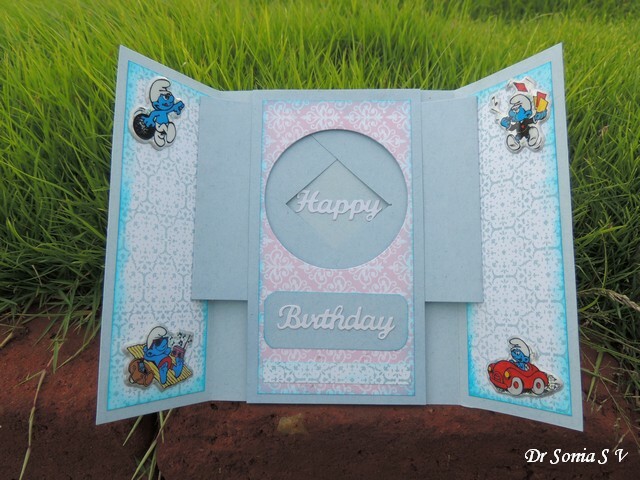 And here is another view of the Pop Up Card to show how the card strip pops up! 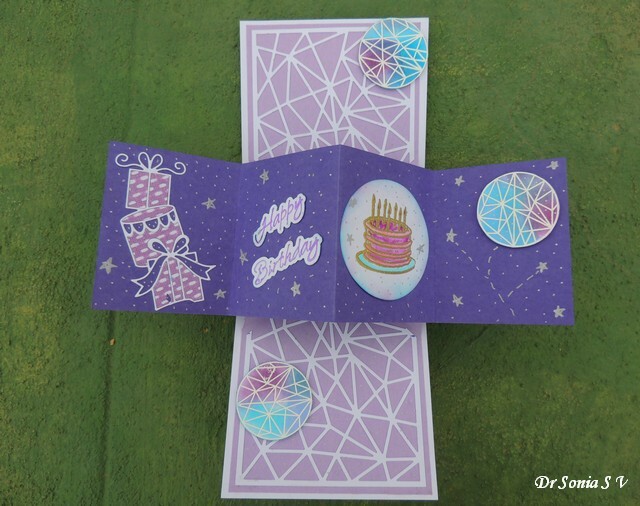 Hi friends though I love making fancy fold cards this is my first attempt at a center step card and though technically the card was easy [I followed Joann's tutorial ], my mojo was at a low and boy did I struggle to embellish it ...my mind visualised something but my hands created something entirely different...if you know what I mean! And on more than one instance I was tempted to dump it all in the dustbin! 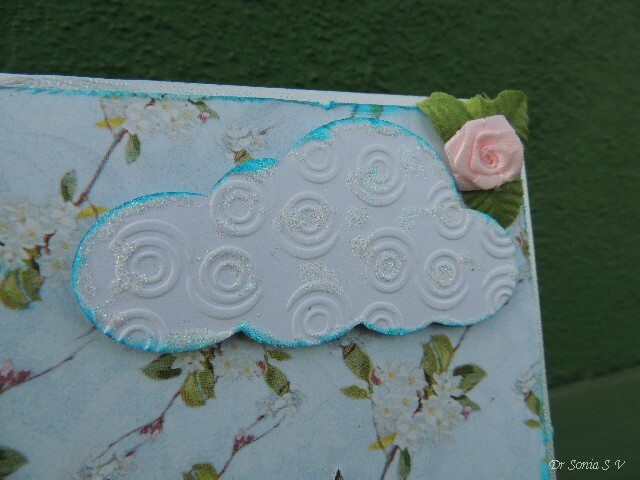 Made the central panel with a crackle stamp , sprays , Distress Inks and stencilling with inka gold. 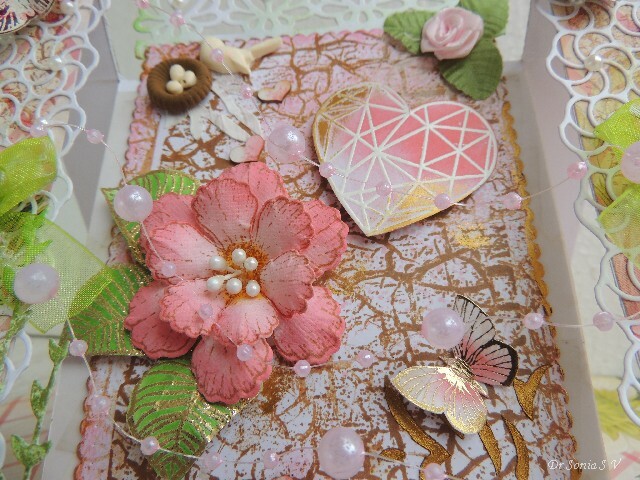 The sparkling golden leaves were heat embossed using the Winnie and Walter In Bloom Elsa's Flora Stamp Set and the flower was made using Heartfelt creations stamps and dies. The heart is from the Winnie and Walter True stamp set- it was heat embossed in white and colored with Distress Inks.I smeared Inka Gold on the heart and on random areas on the crackle background to give a golden sparkle. 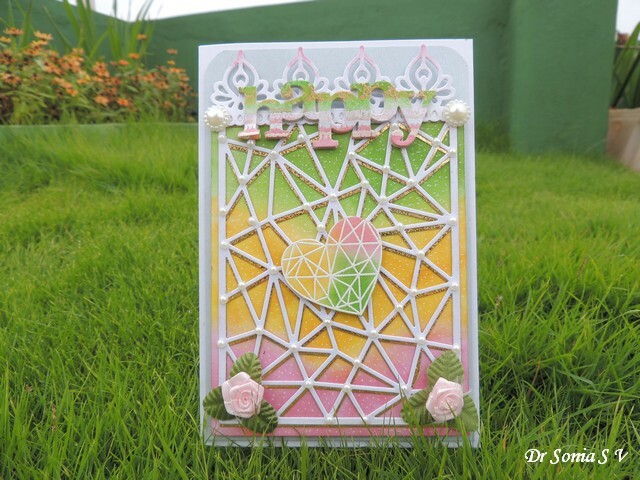 While I was making this card, my in house critique , my 10 yr old daughter ,told me bluntly that the side panels and the centre looked rather disconnected!Well I had to agree with her and I added pink ribbon roses and a twirling pink pearl string across the central panel and side panels to try and bring about a coherence though am not sure how much I have succeeded! What do you think my friends? 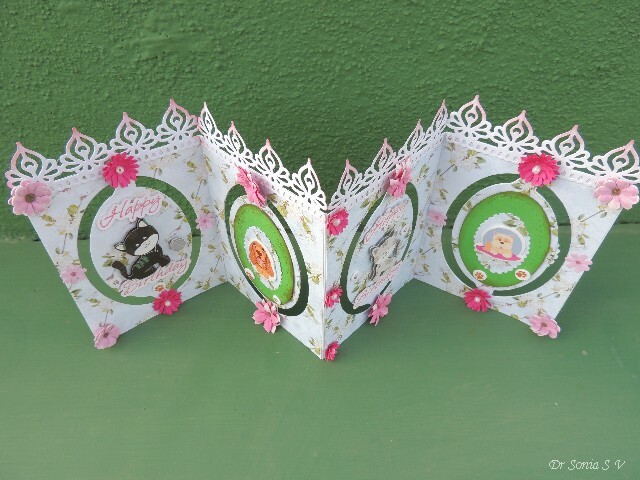 Hi friends sharing 2 fun Interactive cards which I made to give to my daughter's friends. We stay in what is popularly called as a "residential layout" in India and my daughter gets invited to a lot of birthday parties ! 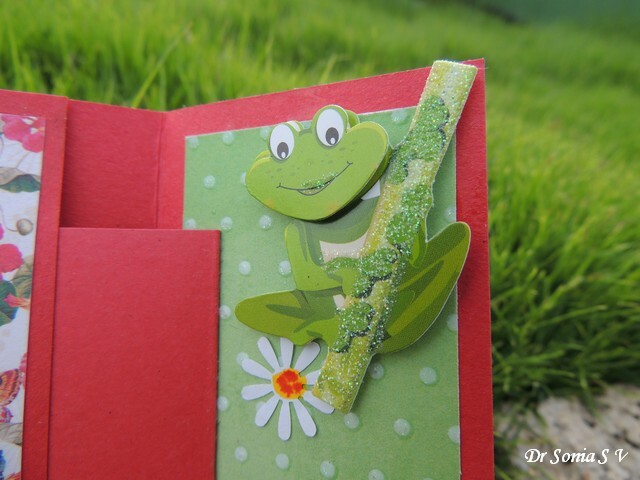 Over the months I realised that rather than my usual floral cards I needed to make kid friendly simple and fun cards! 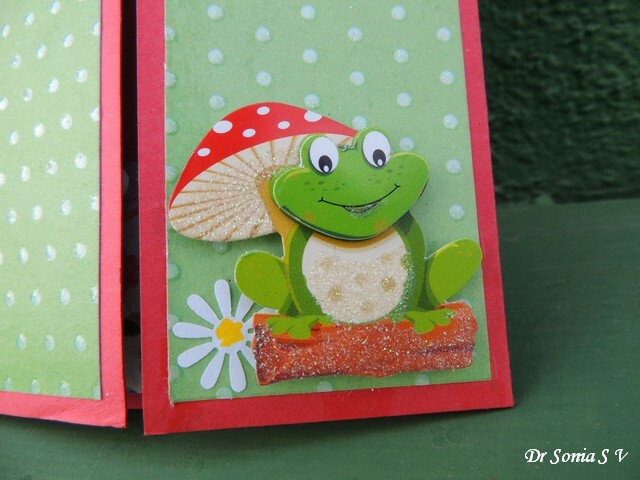 Sharing two cards which I am hoping will appeal to both boys and girls! 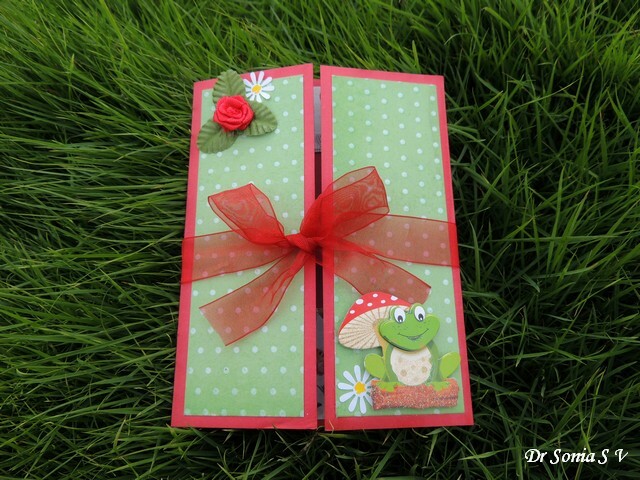 The Garden themed card with froggies is an interactive gatefold card which on opening has a window magically appearing to reveal a sentiment! With the rainy season starting in Bangalore my garden has lush greenery and lots of croaking little and not so little froggies! 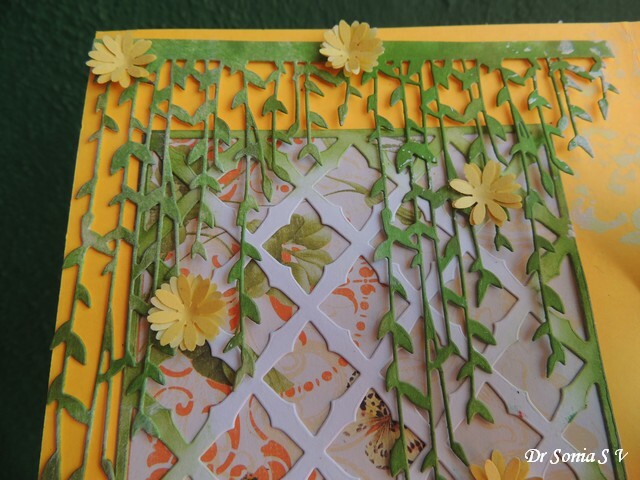 Do you think boys will like this one despite the flowers? This short video shows how the Interactive Shutter Card works. 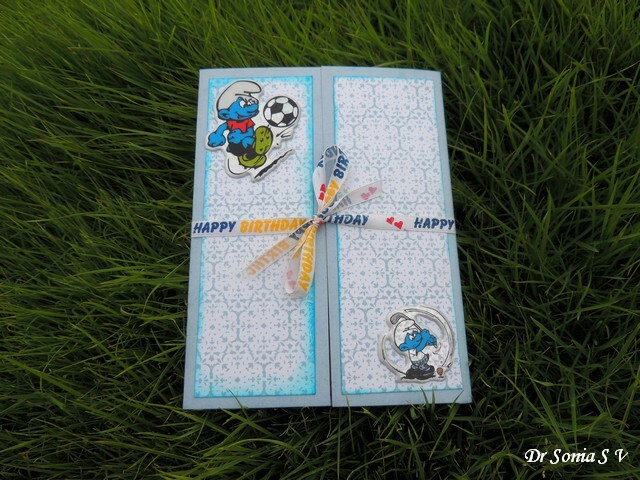 I went with a theme which will appeal to little boys ...cute smurfs bowling and playing golf and generally goofing about! 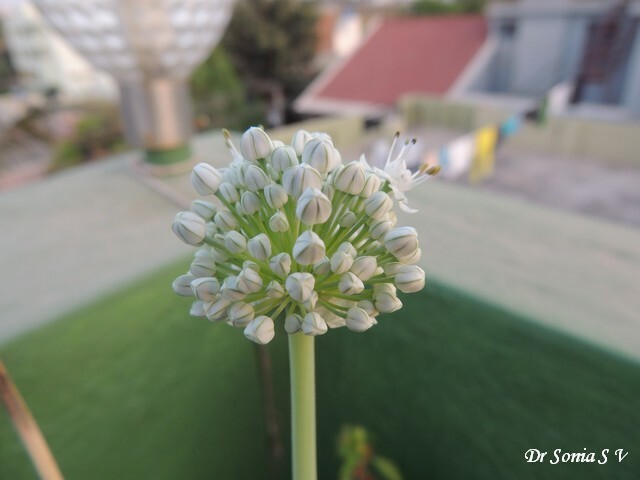 Hi friends though I stay in Bangalore which is a busy metropolitan city we are lucky to have a home away from the hustle and bustle of usual city life! Birds are regular visitors to our home not only because of the fruit and vegetable garden my hubby grows but because our darling doggies [Snowy, a Lhasa apso and Goldy, a cocker spaniel] let the birds drink and eat right from their dishes! 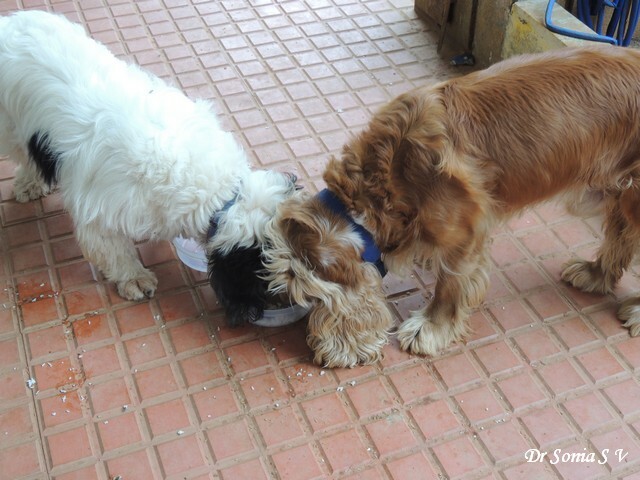 And as you can see from the picture above of our doggies eating from one bowl [ yeah they never ever fight!! 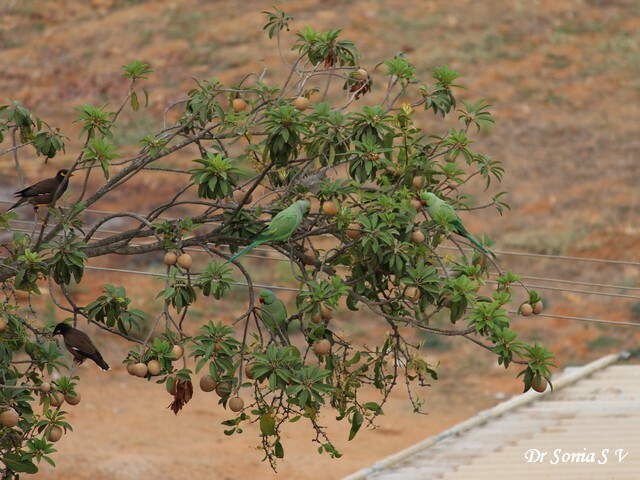 ], they are rather messy eaters and the birds literally have a buffet spread everyday! 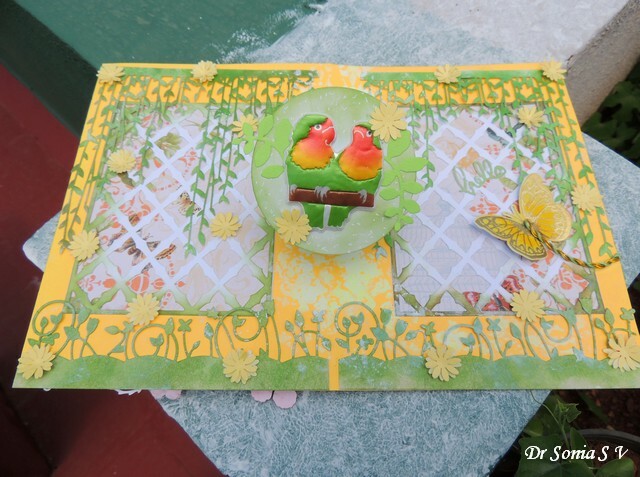 Now coming back to my card I used a special twist up pop up mechanism to pop up parrots on the center of my card and added butterflies and yellow flowers galore to my garden! 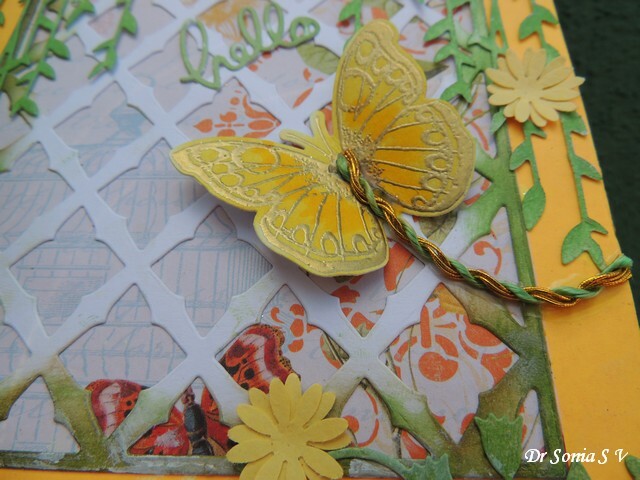 The yellow butterfly is a Hero arts stamp heat embossed and colored with Distress Inks and I added a green and golden twine trail to it! 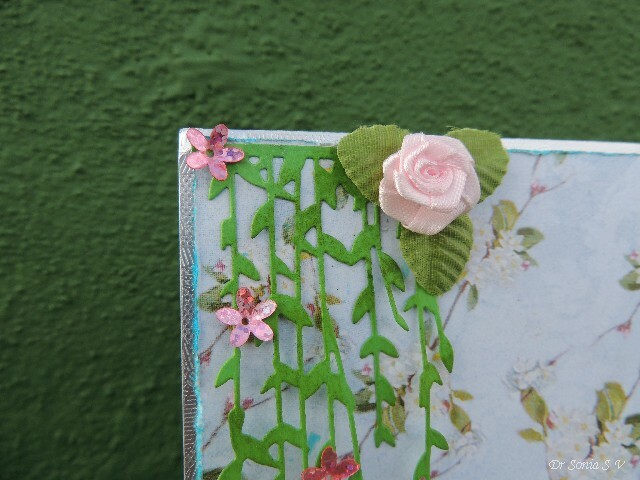 I love Poppy Stamps dies and here I have used 2 of my favorite dies to create the lattice and hanging vines for my garden! In the picture above you can see how the pop up mechanism is . 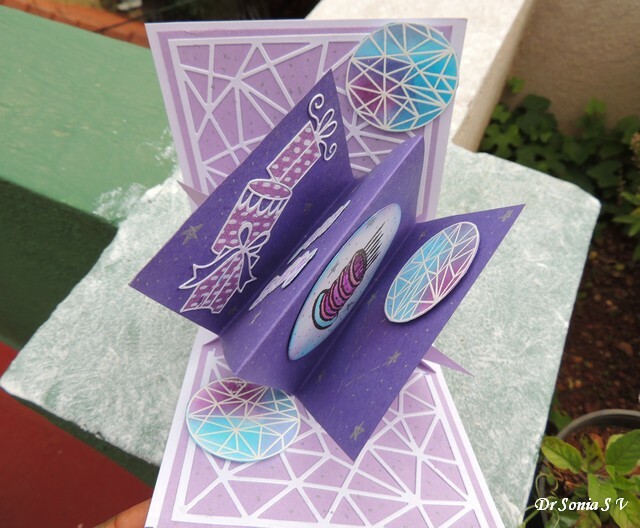 It's a rather tricky mechanism which I learnt from a book on Pop Up Cards. 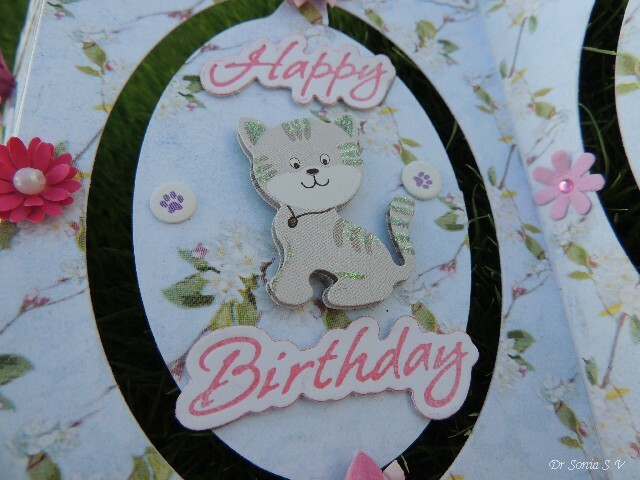 I have seen a die for this type of Pop Up Card on my friend Alice's blog . Here is the short video showing the pop up mechanism. 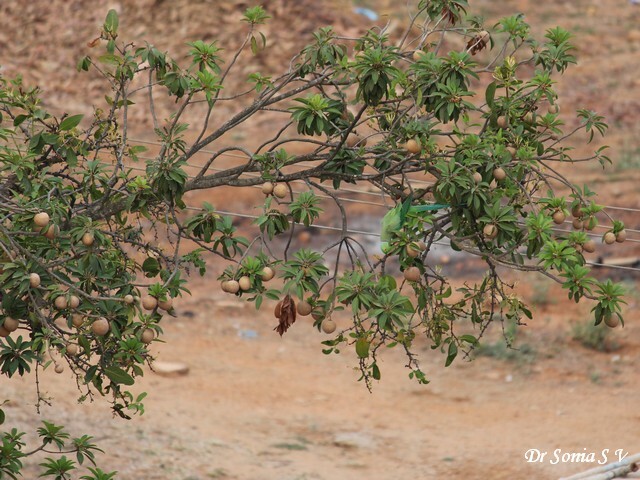 And sharing a few pictures which inspired my card ...... the photo below is the view from my window and you can see a lone parrot relishing the Sapota fruits! 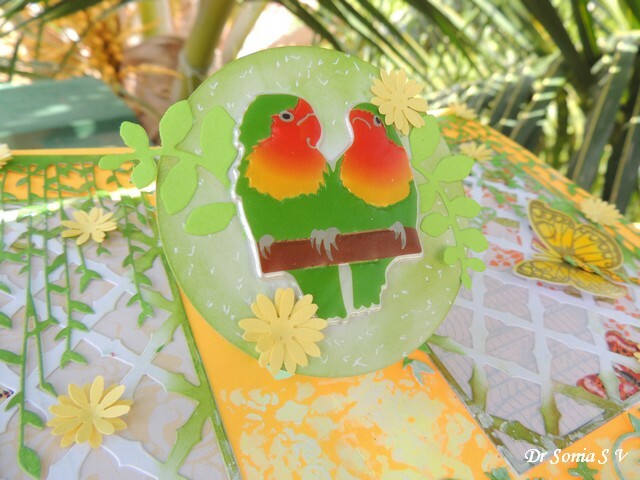 Hehe yeah there are 3 parrots and 2 mynahs!! What a delight they were to watch! And I cant resist showing off my hubby's Lilies! 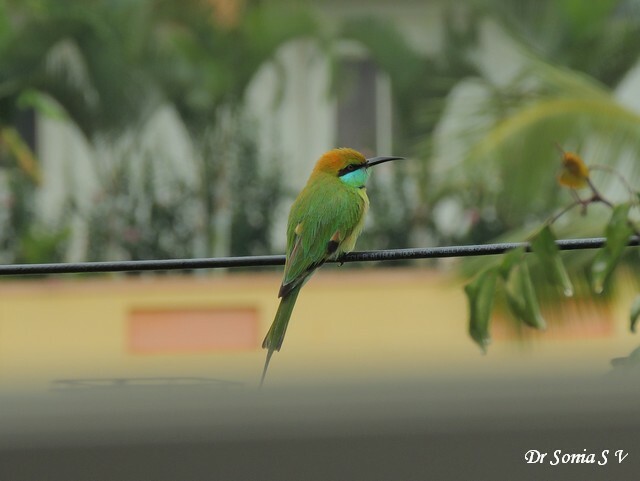 And that is the "Bee eater" , yes quite a ferocious sounding name but such a beautiful cute bird and a common visitor to our locality! 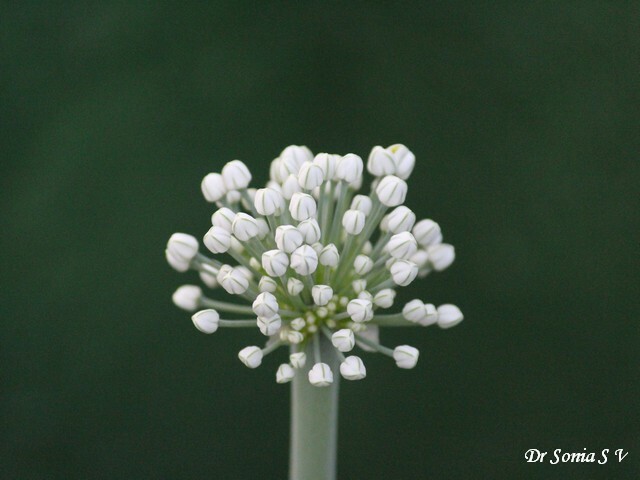 I hope you enjoyed the peek into my garden and reading about our garden visitors! 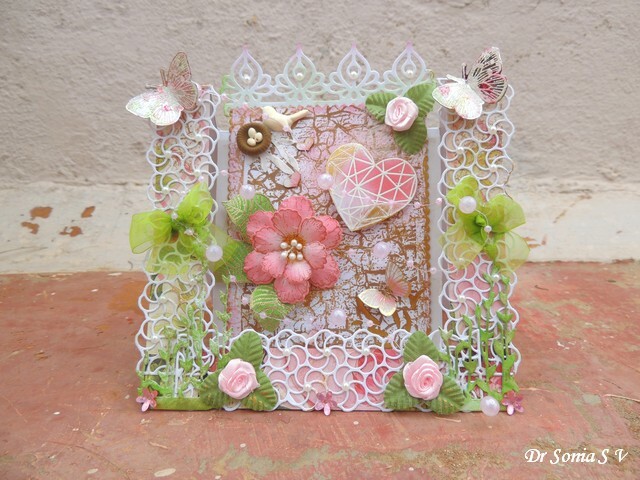 Edited : This card was featured by Di at her Pixie's playground----Thank you so much Di its an honour ! 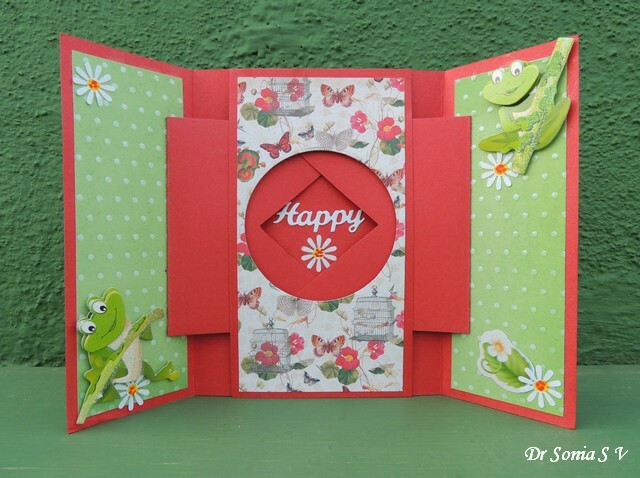 Hi friends I was feeling quite down in the dumps yesterday and decided to make a colorful "Happy " card to chase away some of those blues! 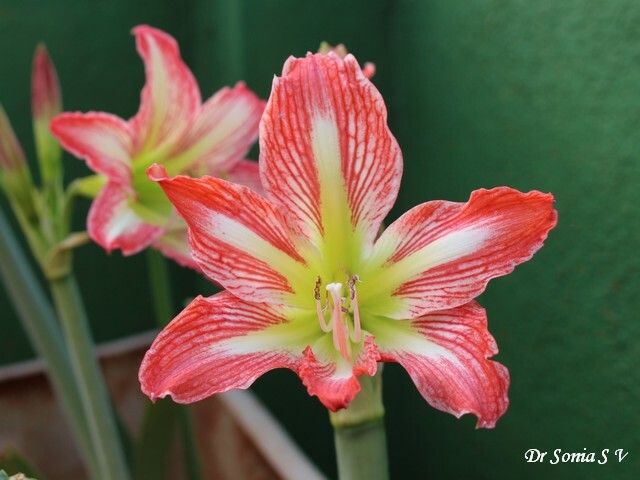 And yes I have photographed this "Happy Heart"card on our terrace garden! 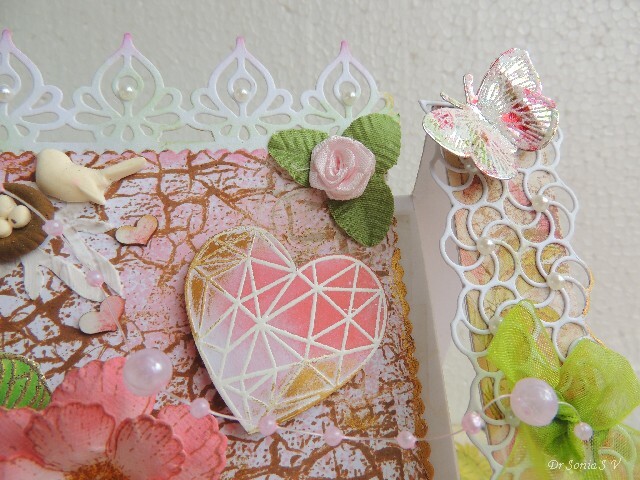 The heart is from the Winnie and Walter True stamp set and was heat embossed in white, fussy cut and sponged with Distress Inks . 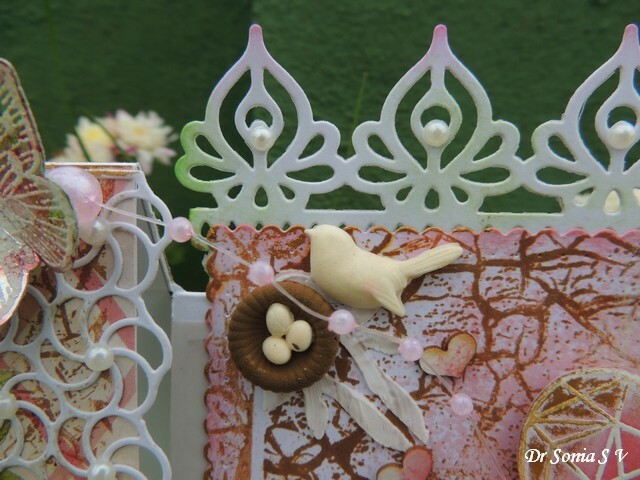 The background was sponged using mowed lawn, abandoned coral and wild honey Distress Inks and white dots made using a white gel pen. 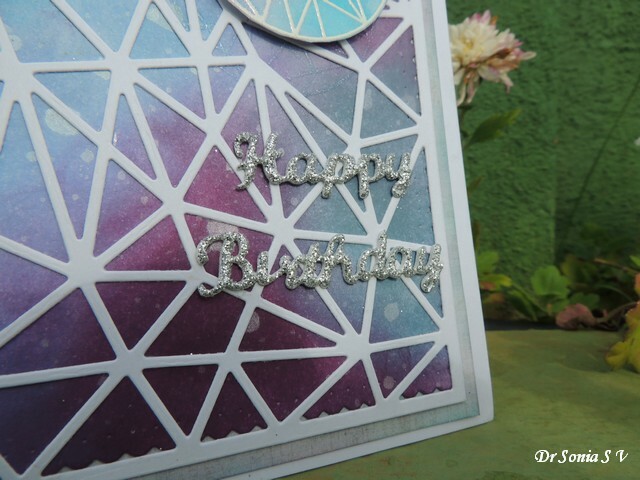 The Happy as 3 layers staggered using foam tape. 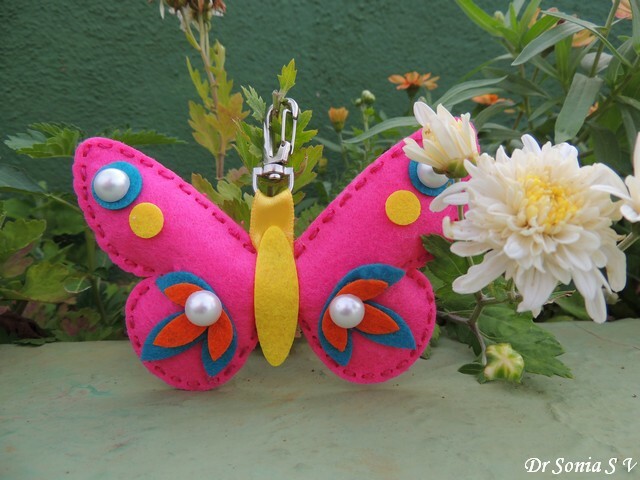 Hi friends Thank you so much for the sweet supportive comments on my daughter's felt charms! 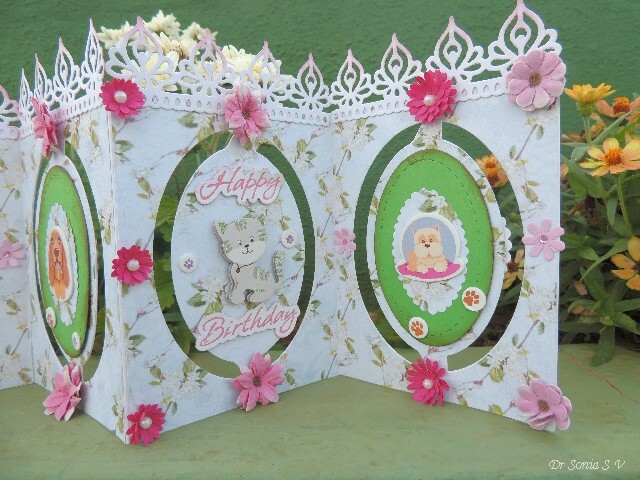 Sharing an accordion card I had made as a birthday card for my daughter[ the Pom Pom Bunny Card shared earlier was made for my mum to give my kiddo!]. 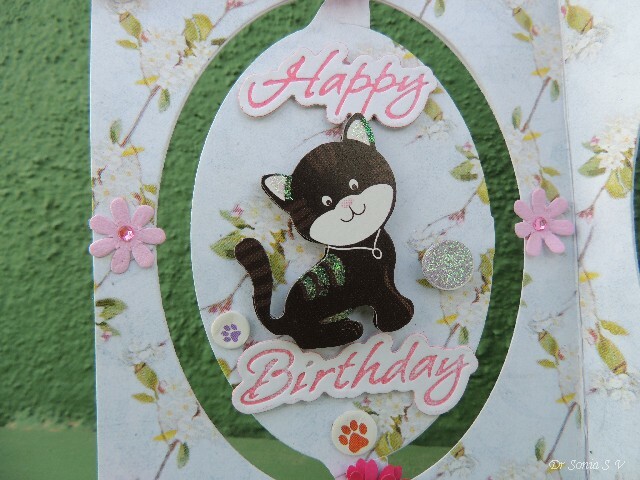 My daughter loves cats and dogs so I could make a simple interactive card by using some cute feline and puppy stickers . We have 2 dogs at home...one is a Cocker Spaniel and the other is a Lhasa Apso and I was thrilled that the doggy stickers I used looked somewhat like our own fellas! 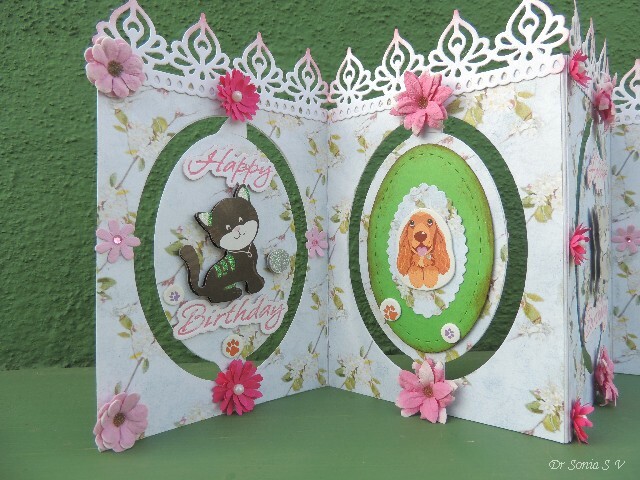 Well the puppies and kittens need a garden to play in so added a floral themed pattern paper and simple punched florals and Itsy Bitsy flowers. 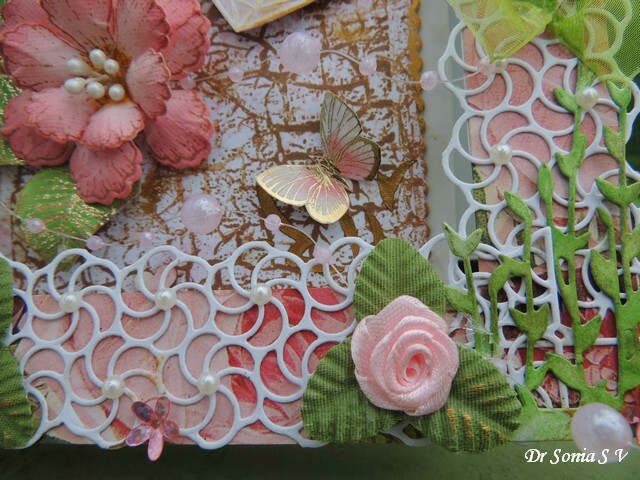 The lacy border atop was made using a Spellbinders die and subtly shaded with Distress Inks to match the pink of my flowers. 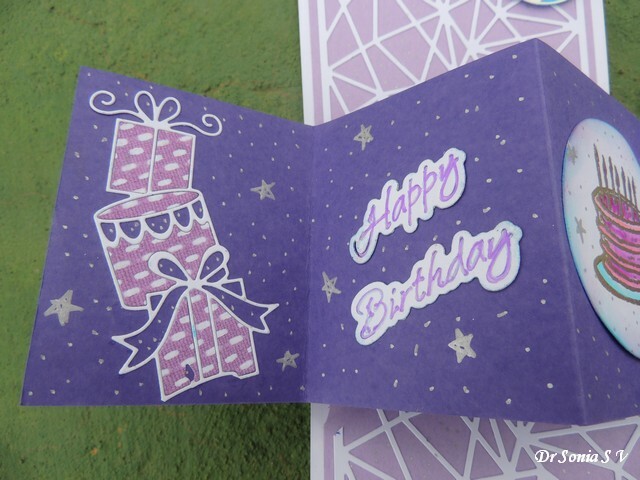 It looks like such a simple card but this was made on the eve of her birthday after a long day of baking, preparing party food for the birthday party , racking my brain for party games and of course all the cleaning and decorating so it felt like a mammoth undertaking!! Oh Yes we did have a themed party this year too...my daughter seems to have the idea that a birthday is grand only when it has a theme!! Ooh the pressures of modern day motherhood!! 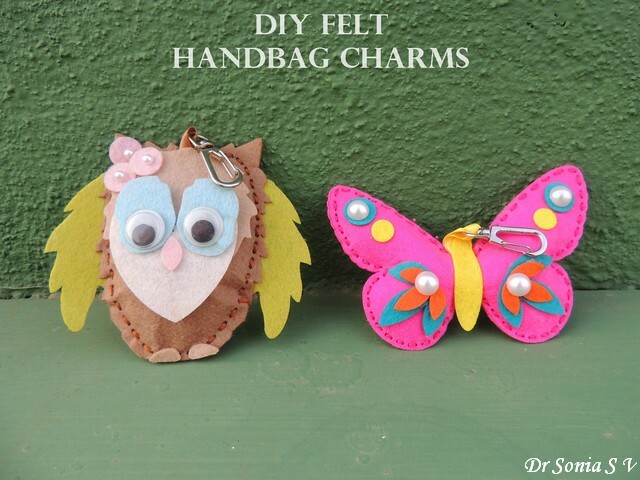 Hi friends , many of you know that my daughter loves to craft!Well in this post my 10 yr old is donning the DT cap for Crafters Corner and demoing 2 super cute DIY felt key chain/ bag charm kits in a You tube video . Many of us dont have patience for videos [ myself included] but please do check out the first few seconds of the video as it includes a classic "faux pas" and which my little one agreed to include hoping it will make you smile! 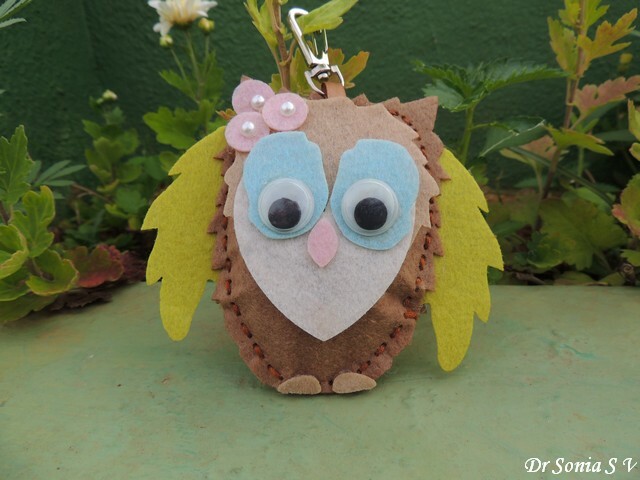 So here is the cutie owl my kiddo made . My daughter is learning french this year and has named her little owl " Hibou" which is french for owl! Hibou is hanging happily on her school bag and goes to school everyday!! 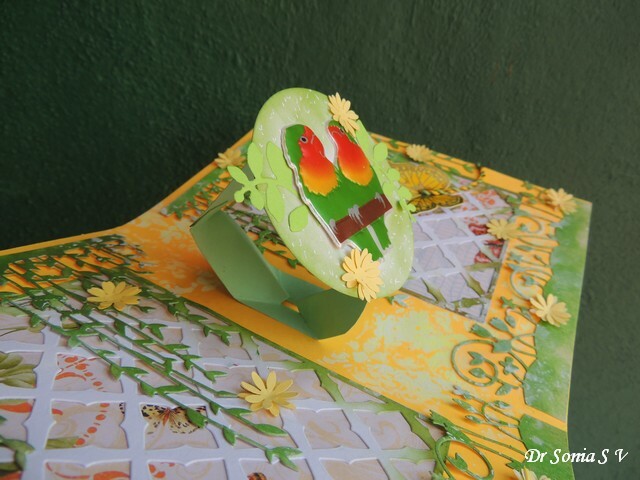 I hoped you liked my kiddo's DT work and if you can spare a few seconds ...do give her video a thumbs up!! 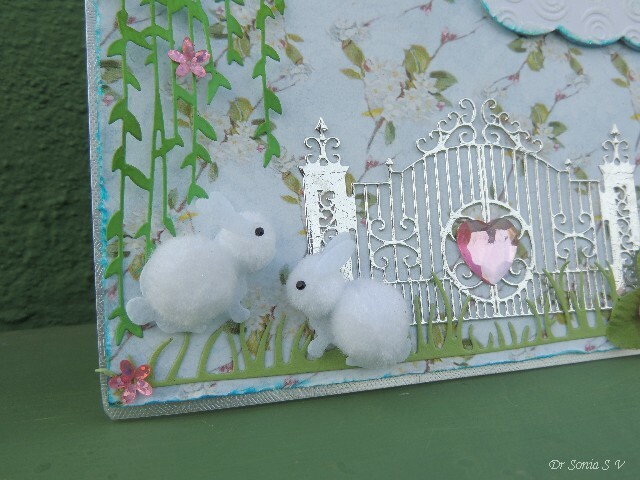 Hi friends my daughter celebrated her 10th birthday in May and since I had house-guests I was awfully busy and managed to make just a simple card adding a single cute element which I knew she would love-- the pom pom bunnies! This card was actually made for my mom to gift to my kiddo. 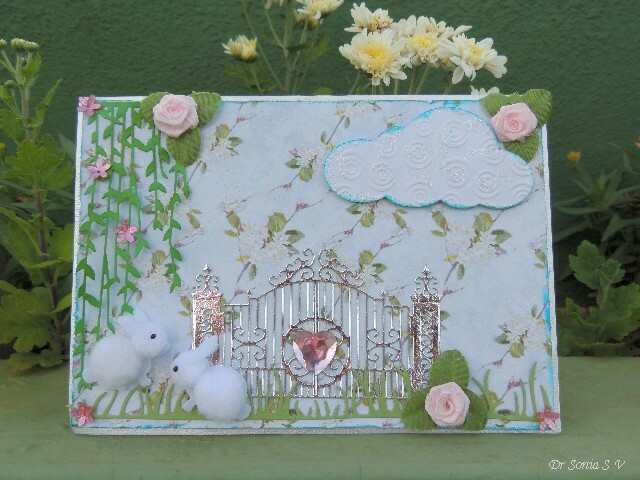 Since I didnt have a lot of time to work on it kept it as a simple garden scene with a sparkling cloud ,a floral pattern paper background and a lovely gate! The pink heart is a sparkling rhinestone I had been hoarding for quite some time and my daughter loves bling! 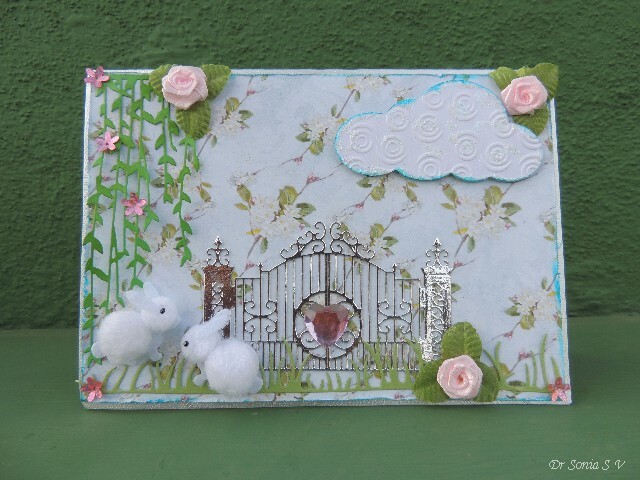 The bunnies' garden has a hanging vine with tiny flower sequins and some teeny weeny pink ribbon roses. 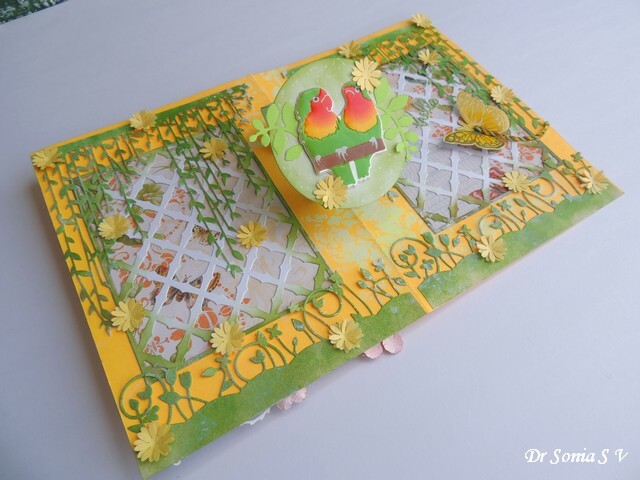 Not the best of my creations and I feel quite guilty for not having made a more elaborate card though the bunnies frolicking on the grass did make my daughter squeal in delight!